Fox Searchlight Pictures Presidents Nancy Utley and Stephen Gilula announced today that the company has acquired US rights to JACKIE, directed by Pablo Larraín (NO; NERUDA) and written by Noah Oppenheim, from LD Entertainment. The film stars Academy Award winner Natalie Portman, Greta Gerwig, Billy Crudup, Academy Award nominee John Hurt, and Peter Sarsgaard. JACKIE is produced by Juan De Dios Larraín, Darren Aronofsky, Mickey Liddell, Scott Franklin, and Ari Handel. The filmmaking team includes cinematographer Stéphane Fontaine (RUST AND BONE), editor Sebastián Sepúlveda (THE CLUB), production designer Jean Rabasse (THE DREAMERS), costume designer Madeline Fontaine (AMELIE) and music by Mica Levi (UNDER THE SKIN). The film is scheduled to open on December 9, 2016. Oppenheim’s original script won Best Screenplay at this year’s Venice International Film Festival. actors and artists, the film is one we are thrilled to bring to audiences later this year,” said Gilula and Utley. 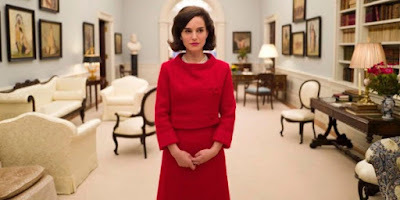 “I am delighted that Fox Searchlight will be releasing ‘Jackie’,” said Larraín. “Their movies have been an important influence on me as a filmmaker, and it is a personal achievement for me to have them bring this very special story of a beautiful, sophisticated and mysterious woman to the world. Jackie was the most unknown of the known women of the 20th century.” Larraín previously directed the acclaimed film NO, which was nominated for Best Foreign Language Film on behalf of Chile at the 2013 Academy Awards. “LD Entertainment, Protozoa Pictures and Fabula are proud to collaborate with Fox Searchlight Pictures in bringing Pablo's English-language debut feature to stateside audiences,” said the film’s producers in a joint statement. The deal was brokered by Fox Searchlight’s Executive Vice President of Business Affairs Megan O’Brien and Senior Vice President of Acquisitions & Co-Productions Ray Strache, and CAA, which also packaged and arranged the film’s financing, and Mickey Liddell on behalf of LD Entertainment. Pablo Larraín and Noah Oppenheim are represented by CAA and Management 360. Natalie Portman is represented by CAA.